By Worshipful Harry R. Deming. On May 22, 1901, twenty Master Masons, residents of Wilmington, met at Hiller's Cranberry House on Middlesex Avenue, Wilmington, to discuss the formation of a Masonic Lodge. At this meeting, Worshipful Edwin L. Haley was chosen Chairman, and Brother George L. Perry, Secretary. Quite in contrast with the present day lodge apartments were the furnishings of Friendship Lodge in its beginnings. The walls and rafters were covered with burlap; the members sat on wooden settees; kerosene lamps furnished the light; the only heat found its way into the lodge room by opening the double doors. The Alter, Senior Wardenís and Junior Warden's stands, which are still in use in our lodge room, were built by Brothers William L. Kelley and John T. Wild; the burlap was contributed by Brother Harriman, the Bible by Rev. Brother Rollins, the Square and Compasses by Good Samaritan Lodge of Reading, the organ by Brother Hill and many other contributions not recorded. The first member raised in Friendship Lodge was William Henry Haley on December 18th, 1901. On December 31, 1904, the members voted to purchase the ìHiller Tower Building, the present lodge apartments. During 1905 extensive repairs and alterations were made, and the first meeting of the lodge in its new home was held on January 17, 1906. The building was dedicated by Most Worshipful Grand Master John Albert Blake and Grand Lodge Officers on February 21, 1906. Friendship Lodge started its financial structure with $46.00, contributed by its members. At the close of its first year, the cash balance was $8.44. To pay for the Hiller Tower Building, the members subscribed $1725, receiving in return, notes at 5% interest. For repairs, alterations, etc., $3300 was raised by a mortgage on the real estate. In 1910, it was found necessary to borrow $1000.00 more, on a second mortgage. This was paid in full in March 1918. The last payment on the first mortgage, $400.00 was paid in 1920, and the mortgage burned by Right Worshipful Brother Hill, at the Annual Meeting of that year. Following the burning of the mortgage, a banquet in the lower hall was tendered Worshipful Brother Harriman, retiring Treasurer, who served from January 1909 to January 1921, and to Right Worshipful Brother Hill, retiring Secretary, he having served from January 1906 to January 1921. A bounteous dinner, gifts to the retiring officers, addresses by Right Worshipful Frederick L. Putnam, Right Worshipful Robert W. Oliver and Worshipful Guy Ham, singing and music by an orchestra made up an enjoyable evening. The social activities of the lodge during the early days consisted principally of fairs, ladiesí nights, dances and card parties, which were very successful and added materially to the lodge treasury. Visits by members to Thomas Talbot Lodge, Billerica; Mount Horeb Lodge, Woburn; and Good Samaritan Lodge in Reading, were frequent, and made principally by horse and buggy, or trolley. On December 17th, 1919, a Welcome Home Reception and Dinner was tendered these Brethren, and fifteen out of the seventeen were able to be present. Gifts were presented and the lodge was honored by having speakers, Grand Master-Elect Arthur D. Prince, Right Worshipful Robert W. Oliver, District Deputy Grand Master and Worshipful Frederic L. Putnam, Grand Lecturer. The bronze Memorial Tablet bearing names of these service Brethren was dedicated October 18, 1922 by Right Worshipful Percy W. Witherell, District Deputy Grand Master, and Grand Lodge Officers. Although taken as a matter of course in todayís life, the installation of electric lights in the summer of 1913, thereby replacing the kerosene lamps; town water in 1935, when the hand pump in the kitchen was retired, and the purchase of the present organ in the Fall of 1926, at a cost of $2691.00, were important events and added to the comfort and pride of the members. The expenditure of the latter sum was no small item in those days. Credit should here be given to the Officers and members of Acacia Chapter N. 80, Order of the Eastern Star, for their liberal contributions toward the cost of the organ. Five of our members have been awarded Fifty-Year Veteran Medals by the Grand Lodge: Brother George Warren Buck initiated in Thomas Talbot Lodge, March 5, 1895; Worshipful Caleb Samuel Harriman initiated in William Parkman Lodge, April 1, 1897; Brother John Robert McIntosh initiated in Good Samaritan Lodge, May 18, 1899; Right Worshipful George Clark Hill initiated in Good Samaritan Lodge, September 1, 1899; and Worshipful George Lewis Perry initiated in Thomas Talbot Lodge, January 1, 1901. On December 20, 1916, Brother George Allison Hart, a Charter Member, was made a Life Member. He was Tyler from 1902 to 1917, and received the Henry Price Medal from the Grand Lodge on March 20, 1918. The Joseph Warren Medal was presented to Worshipful Harry R. Deming on January 17, 1940, by Right Worshipful Paul N. Shiverick, District Deputy Grand Master. This Medal was presented for distinguished service in masonry for having been present at every stated communication for twenty-eight consecutive years. On December 19, 1906, Worshipful William L. Kelley presented the Lodge with a gavel made from a piece of the original wood taken from the United States Ship Constitution, expressing the wish that it be used only when the Master opens his lodge on entering and closing the lodge when retiring from office. The lodge voted to accept the gavel, with thanks, and to respect his wishes by considering them a condition of its acceptance. After standing a moment in silent tribute to our departed Brethren and those unable to be present, the members proceeded to the lower hall, where a chicken supper was served by the ladies of the Eastern Star. The speakers of the evening were Right Worshipful John A. Avery, Worshipful Frederick L. Putnam and Rev. Brother Walter H. Rollins. Our members were saddened by the death of Right Worshipful George Clark Hill on May 17, 1951. He was our first Master under charter, Secretary from 1906 to 1921, and District Deputy Grand Master in 1913 and 1914. Although not able to be with us except on special occasions, his love for and interest in Masonry continued until the last. He presided in the East at our Past Masterís Night the evening before he passed to his Great Reward. His Records as Secretary were examples of accuracy, clarity and fine penmanship, of which Friendship is justly proud. Neither time nor space will permit enumerating all the names of our District Deputy Grand Masters and other members of the fraternity, whose assistance and words of wisdom have helped to guide us down through the years. Outstanding, however, is that of Right Worshipful Frederick L. Putnam Past Grand Lecturer and Honorary Member of Friendship Lodge, whose wise counsel and assistance began even before our charter was granted. The spirit of generosity and rendering service, which existed at the beginning of Friendship Lodge, when officers and members contributed money, materials and labor to furnish the lodge room, has prevailed down through time to our present Square and Compass Club and our members. Interior decorations, extensive repairs and our up-to-date kitchen are but a few of their contributions to the craft. Friendship is comparatively a small lodge, our membership standing at 268 at this writing, and although our growth has been at a healthy rate, the field from which we may expect desirable applicants is limited. The foregoing is intended to be only a brief sketch of some of the important facts concerning our lodge, with the thought that it may refresh the memories of our older Brethren and give our younger members a glimpse into the past. With the lodge entirely free from debt, a spirit of cooperation and harmony prevailing, and having maintained the tradition of good Masonry since the granting of our charter, it is felt that our members, young and old, can look back at the record with pride and without regrets. Mortgage burning, the bestowal of gifts and the choice of new officers occupied three hours Dec. 15, with Friendship Masonic Lodge, Wilmington. Rt. Wor George C. Hill, ex-district deputy and the first to preside over the lodge. took the chair during the proceedings that attended the destruction of the mortgage paper. He sketched the progress of the lodge in its 19 years of existence, and enlightened the new comers by stating that the first meetings were in the old cranberry house where oil lights were used. Then the Tower House was bought and remodeled. Past Master Hill, as secretary* and Past Master Caleb S. Harriman treasurer, reduced the mortgage to ashes which will be deposited in an urn to be placed in the lodge's archives. Worshipful Master Harry R. Deming bestowed on the former a past district deputy's gold jewel and gave Treasurer Harriman an automobile set, upon their retirement from office. During the banquet there was chorus singing. Congratulatory addresses were delivered by Rt. Wor. Robert W. Oliver, past deputy of the Sixth District; Frederick L. Putnam, Grand Lecturer; Guy A. Ham, Past Master of Gate of the Temple Lodge and John T. Hurd, Past Master of William North Lodge. One of Friendship's members came from California to attend the ceremonies. At the annual election Adolph B. Moore was chosen Worshipful Master; Harold E. Melzar, Senior Warden; Wellington S. Brazel Junior Warden; Harry W. de Lorien, Treasurer; Harry R. Deming (P. M.), Secretary. Few American homes and/or businesses are mortgage-free, but thanks to the banking institutions we build and purchase, looking down the highway of life to the point when we're mortgage-free—like Friendship Lodge of Wilmington — is today. Three years ago the Lodge borrowed $15,000 on a 15-year note to do necessary work to the 19th century historic building that had originally been built by a German immigrant as a factory for patent medicine. The former Dr. Hiller Laboratory was purchased as a Masonic temple in 1905 and the original mortgage was burned in 1920. When the exterior failed to hold paint, the membership sought the bank loan in order to restore the structure with vinyl siding. 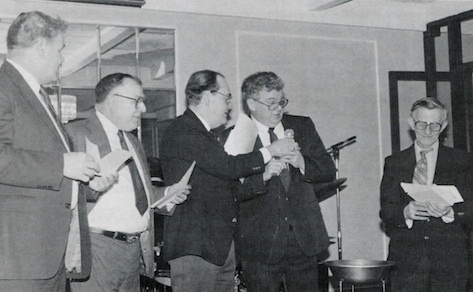 Yearbooks were published and sold to reduce the debt and on Feb. 11, at a special dinner-dance, the second mortgage was burned — 12 years before the final payment was due! 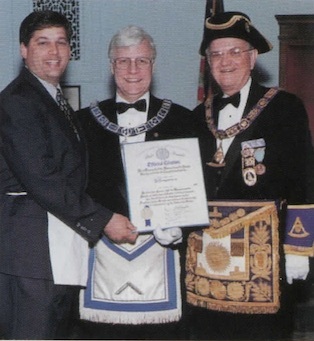 Senior Warden Rubin Frankel (right) whose leadership led to paying off the debt in three years, as he prepares the papers for burning. Wor. Kenneth R. Leavitt, Bro. Roy Serrentino, Wor. William R. Brookings, and Bro. Frederick E. Bent. Wor. Brookings claimed the affair was "the end of a beautiful friendship — with the bank!" Last fall. Friendship Lodge of Wilmington welcomed M. W. Fred K. Bauer to a celebration of its 100th anniversary. Along with a citation from the Massachusetts Senate, a certificate of celebration by the town of Wilmington, a resolution from the Massachusetts House of Representatives, and a greeting from acting Governor Jane Swift were presented. Shown with the former Grand Master are State Senator Bruce Tarr presenting a citation from the Massachusetts Senate to Wor. Philip A. Nowlan, Master. Speaking at the occasion were Rev. Herb Taylor of the Wilmington Council of Churches, and M. W. Bauer, who urged the members of Friendship Lodge to build on its proud heritage.